If you’re searching for Liverpool hotels with balconies, you’ve come to the right place. 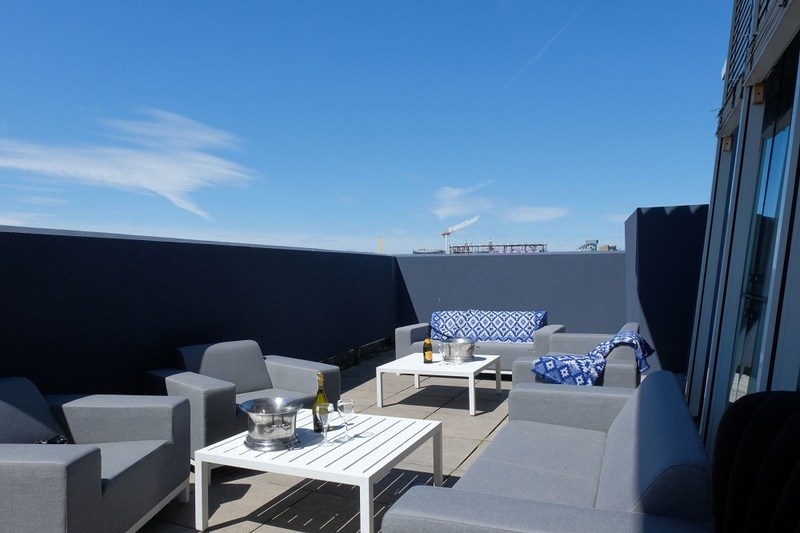 The Skyline Suites, set on the rooftop of Arthouse Hotel in the heart of Liverpool, offer one of the most breathtaking views over the city. Get ready to take in the view of a lifetime from your fabulous outdoor terrace as you enjoy a stay in one of Liverpool’s most popular and unique hotels. Set in the heart of the city’s buzzing nightlife, the Skyline Suites are the ideal party destination for groups of friends and family. Divided into two luxurious suites that can each sleep up to twelve people, these plush rooms have been designed with comfort, luxury and partying in mind. 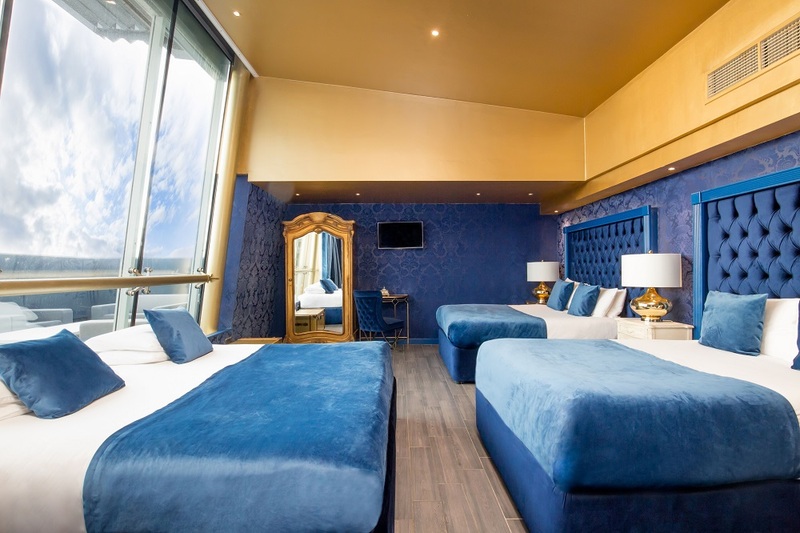 Featuring a stunning blue, white, gold and black theme and a fabulously spacious outdoor terrace that overlooks the incredible Liverpool skyline, the Skyline Suites are number one on the list of Liverpool hotels with balconies. Enjoy a glass of fizz from your room with a view and capture some sophisticated snaps as you enjoy a night you’ll remember forever. 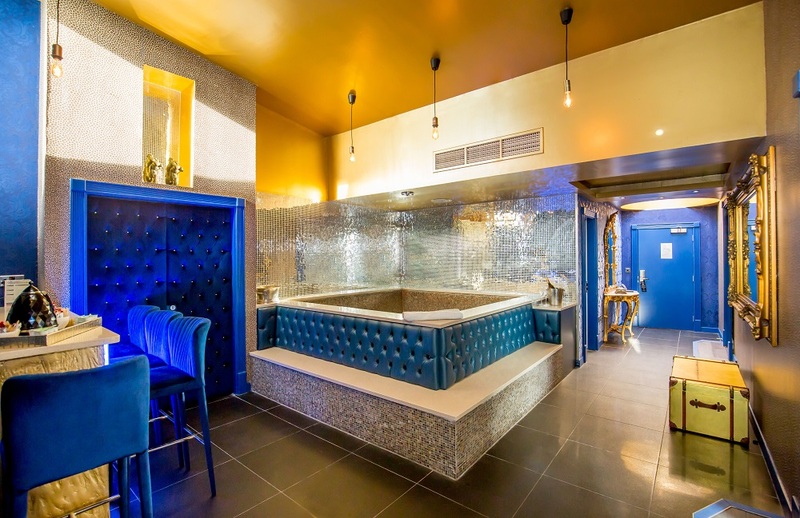 These stunning suites also feature a large whirlpool bath, enclosed by an elegant mirrored, mosaic wall that is sure to make you feel on top of the world. Ideal for celebrations including birthdays, hen and stag parties or graduation, our spacious suites offer a truly memorable overnight stay. Don’t forget to check out our amazing hotel offers pages and find the perfect deal for you and your group. Book your stay in Skyline today! 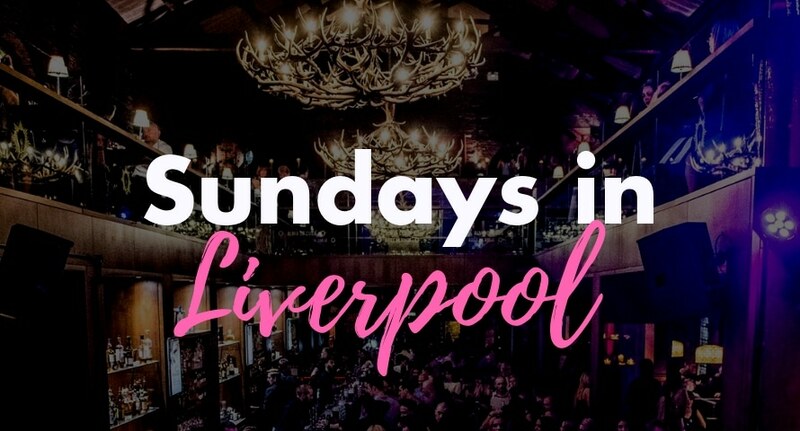 Located along the hustle and bustle of Seel Street, head out for the night and you’ll find Liverpool’s neon lit bars and atmospheric clubs right on your doorstep. Whether you’re into house music, chart, pop or even heavy metal, Liverpool has it all. And it’s all within walking distance from the Skyline Suites. 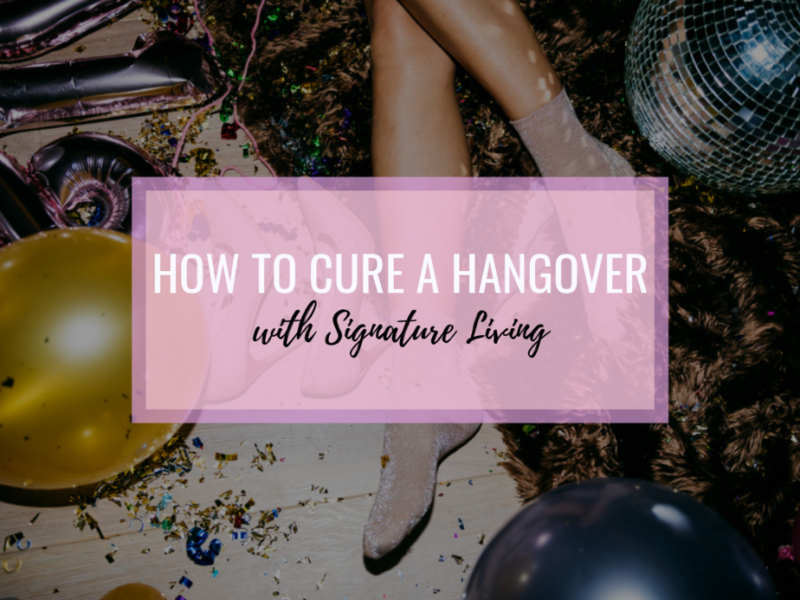 After dancing the night away, you won’t have to worry about flagging a taxi back. You’ll be able to return to your suite in no time and sink into a plush double bed surrounded by your best pals. With a multitude of beds within the same room, you can enjoy each other’s company in true sleepover style and make the most of quality time with your nearest and dearest. And if you fancy breakfast in the morning, look no further than our very hotel restaurant, Mulholland. Head downstairs and indulge in a range of cooked and continental goodness to start your morning right. From delicious pastries to perfectly scrambled eggs, fill your plate with a hearty breakfast to fuel your day in Liverpool. If you’ll be spending the day in the city, don’t miss out on exploring Liverpool’s picturesque Hope Street, only a short walk from Arthouse. You’ll discover the city’s mesmerising Metropolitan and Anglican cathedral at either end of the street, with bustling independent restaurants and cafes along the way. At Signature Living we are experts in luxurious and innovative accommodation. Wacky and wonderful, Arthouse Hotel is tucked around the corner from the heart of Liverpool’s best bars, clubs and restaurants, so you won’t need to worry about transport once you’re here. The Skyline Suites are the latest addition to an array of fantastic rooms at Arthouse. 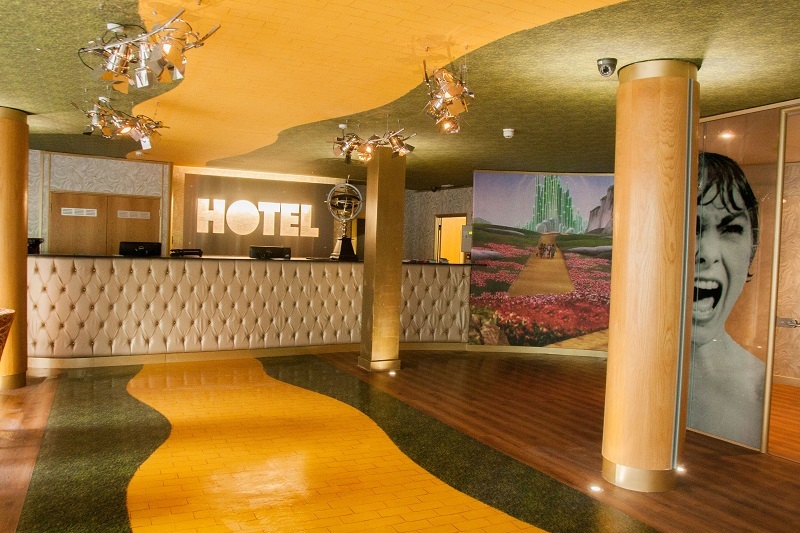 The hotel offers something for everyone, from themed rooms ranging from Marilyn Monroe, Grease and The Rocky Horror Show. Undoubtedly the best hotel for nightlife in Liverpool, at Arthouse we embrace creativity and extravagance. The hotel itself radiates character and charm, a dazzling escape from day to day routine and corporate Liverpool hotels with balconies. So, what are you waiting for? 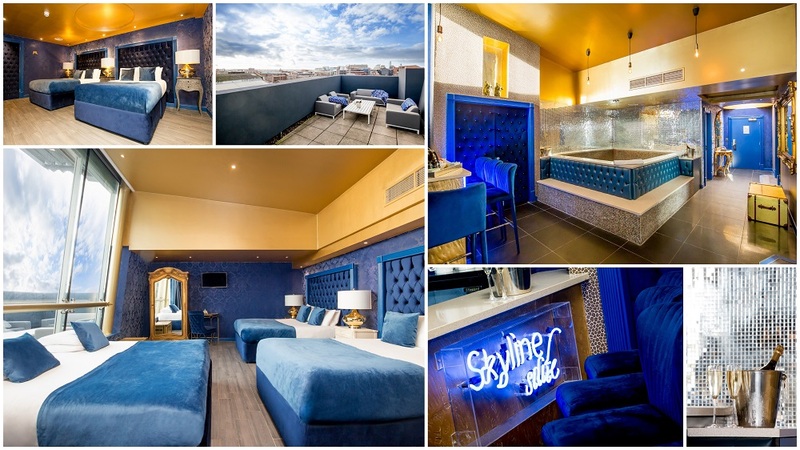 Book a stay in the Skyline Suite and have an unforgettable night in Liverpool. 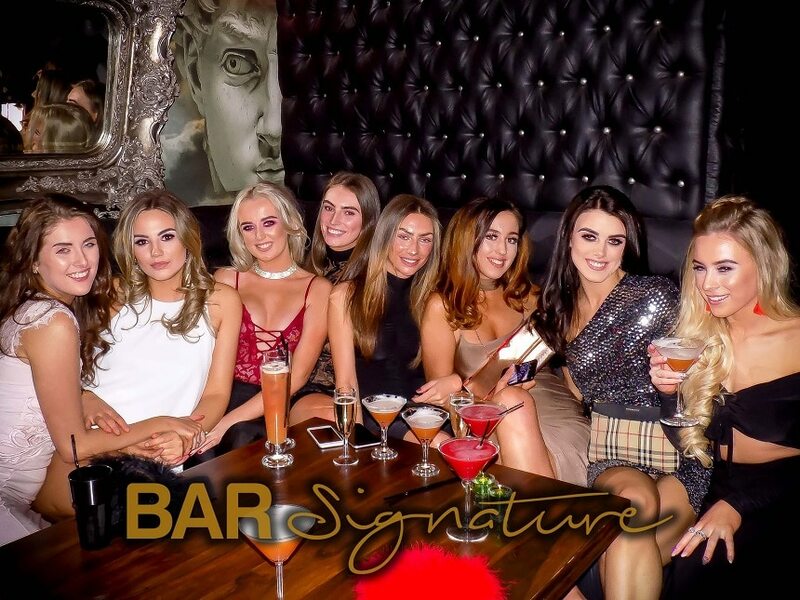 To enquire further about our Liverpool hotels with balconies or to book a stay in one of our famous party accommodation destinations, simply give our team a call today on 0151 236 0166.